Emojis have become an integral part of our conversations online, but compatibility is a major issue, because emojis visible to one user are not always seen by others who may be using a different device or have older OS versions. Twitter has stepped in to solve the issue with ‘Twemojis’, which are Twitter exclusive emojis that will be universally available for all Android versions on smartphones. According to an official Emojipedia blog post, Twemojis will solve the compatibility issue for good, as they will be available to all users by default in the Twitter app, no matter which Android build they are running. The Twemoji set will replace the default emoji catalog available on Android smartphones, which is often updated with new versions of the OS, leading to compatibility issues on devices running older builds. Thanks to Twitter’s custom emojis, users will no longer see the ‘☐’ or the ‘diagonally crossed ballot box’ symbol in their conversation, which signifies that the emoji sent to them is not supported on their Android device. Users of Twitter for Android may notice an emoji change when accessing the service today. Twemoji designs are now shown within Twitter, replacing native emojis previously shown from platform vendors such as Google and Samsung. Users running Android Nougat, Marshmallow, Lollipop and Kit Kat (basically, Android 7.x to Android 4.4) can now see the Twemojis on the official Twitter app for Android. 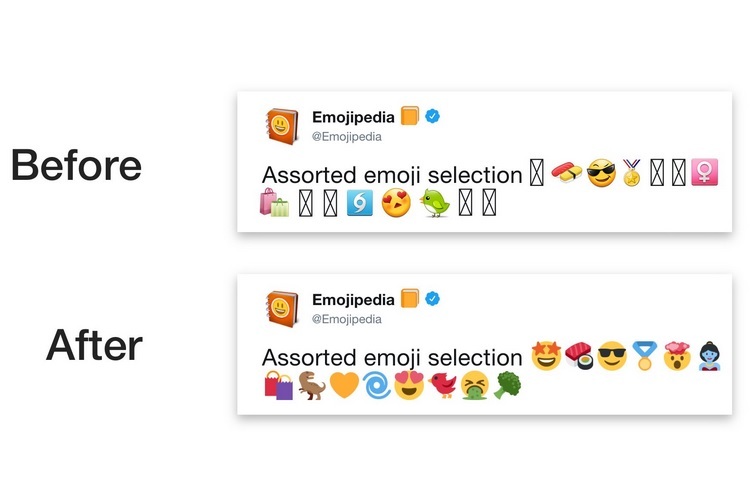 Twitter’s Design Lead, Bryan Haggerty, told Emojipedia that around 50% of eligible Twitter users now have access to Twemojis, which have been under testing since March 2018. Twemojis have been developed using Google’s EmojiCompat Library which was created to solve the emoji compatibility issue. However, Twemojis are an opt-in feature, as users have the choice to revert back to the native emoji set available on their smartphone.